We don't just supply carpet but we sell TRUST! We will go to every feasible means to bring satisfaction to our customers through consistent quality and environment friendly initiatives. relationships with suppliers to make sure we get the right quality! Every piece of carpet that is tufted is inspected to see if any tufts are missing. the tuft height is of the correct length. The mass per unit area of pile yarn is a significant test because pile density determines the feelof the carpet.Backing fabrics are tested for strength by tension testing. The primary backing's strength is checked both before and after tufting. The delamination strength of the secondary backing is also tested by determining at what force the secondary backing can be pulled away from the primary backing. 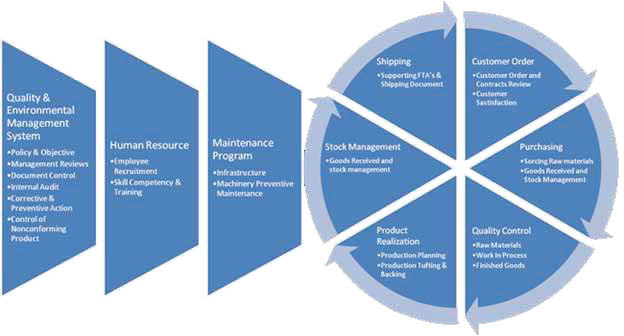 With the implementation of QA Tools to our organization we are able to ensure that our processes are efficient. 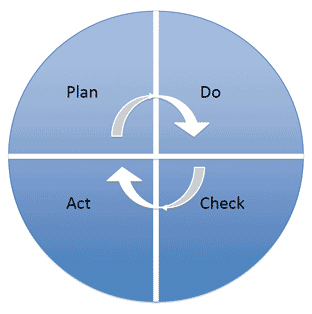 One of them is PDCA (Plan, Do, Check, Act).